Choose File > Properties in Main menu or press Ctrl + D.
Its appearance can be seen below. Document Info tab allows to specify following properties: Title, Subject, Author, Creator and Producer. User also can specify some keywords corresponding to the document’s content in the bottom field. Access to PDF can be limited with password. For security purposes you also can disable some functions, for example printing or editing. However, it is impossible to prohibit saving PDF copies. It is ensured, that copies will have same limitations as original PDF file. Click Change button to set password and edit items in Permissions group. 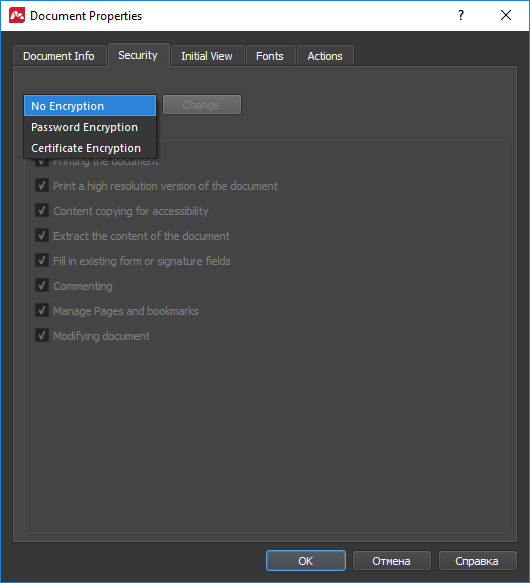 Additional window will appear, it allows to set passwords for the document. Document open password. A password required to open the document. Permissions password. If some functions are disabled for the document (Permissions list), a permissions password for access rights modification must be set. Document open password is not required. If PDF file is protected with passwords of both kinds, it can be opened with any of the passwords. But user has to enter Permissions password to access Permissions. It is adviced to set both passwords to establish better security. Print the document. Printing is possible with 150 dpi or lower resolution. Print a high resolution version of the document. Printing is possible with any resolutions. Content copying for accessibility. Allows users to select and copy document text. Extract the content of the document. Allows to copy text and other objects. Fill in existing form or signature fields. Users may fill and sign form fields. Doesn’t allow to add comments and create new form fields. Commenting. Filling form fields and digital signature signing. Users may sign with digital signature, leave their comments and ,fill forms. However, users cannot move objects on the page or create new form fields. Manage pages and bookmarks. Allows to insert, remove and rotate pages, create bookmarks and thumbnails. 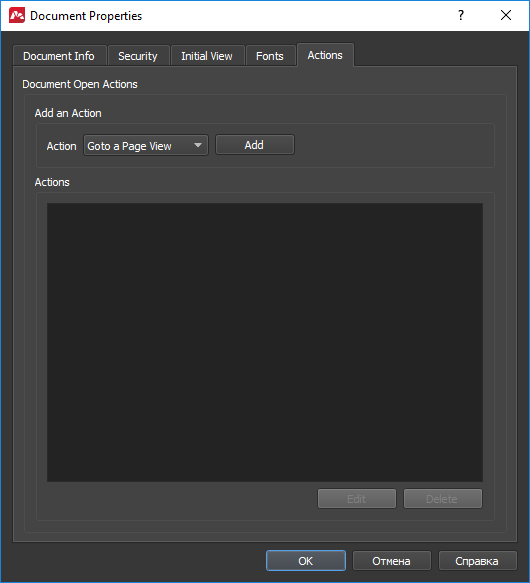 Initial View tab provides means to set view of the workspace of the document for any PDF viewer used to open it. Here you can set initial view of pages and navigation panel, zoom, window parameters and user interface settings. To view PDF presentations, set “Open in Full Screen mode” window option. When opening the file second time, Initial View settings will be ignored by Master PDF Editor if you set Restore last view settings when reopening in Tools -> Settings menu item on System tab. Navigation Tab. Choose tab which will be displayed on the Navigation Bar. Page layout. Choose required page layout. Current Master PDF Editor version supports only continuous pages view mode. Open to Page. Choose number of the page which will be opened on document load. Display document title. 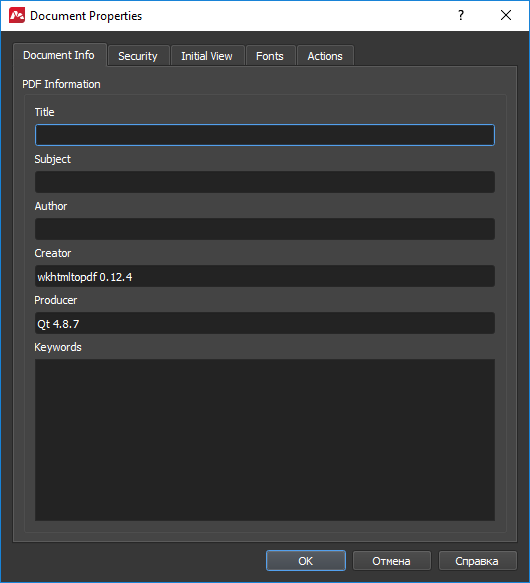 Choose whether document title or file name should be displayed in window title. Document title is used same as on «Document Info» tab. Open in Full Screen mode. 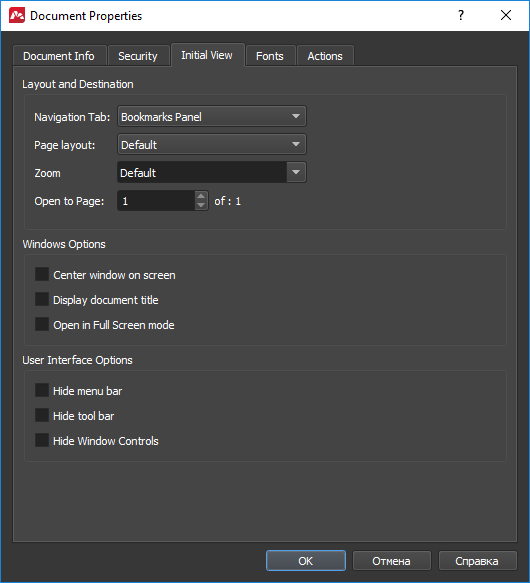 Set largest possible document window size and display mode without menu bar, toolbar and controls. Use F11 key to exit Full Screen mode. With this mode modifying the document is possible with hotkeys only. Center window on screen. Not supported. Added for compatibility with some other applications. Settings for the work-space elements display. Hide menu bar. Hide/show menu. Hide tool bar. Hide/show toolbar. Hide Window Controls. Not supported in Master PDF Editor. Added for compatibility with some other applications. 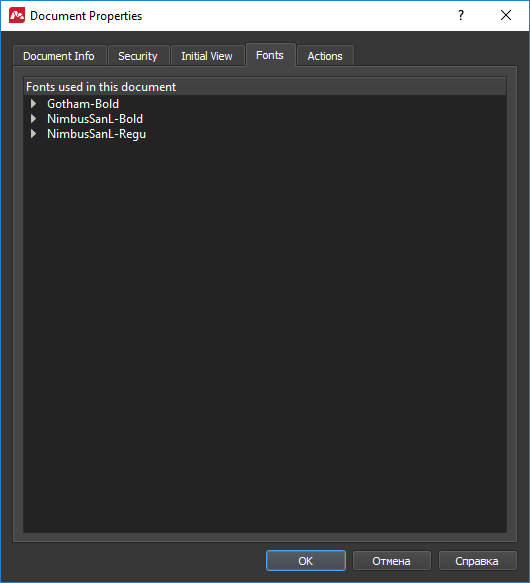 Fonts tab provides a list of all fonts used in the document.